The Peekskill Trolley Company makes a memorable alternative to a standard bus rental. Big windows all around allow a great view, and upper tier windows add additional natural light. The beautiful natural oak interior and brass accents take you back in time. Stella’s large rear galley area, complete with a brass railing, is a perfect place for a display of any kind whether it be to advertise your product or to serve refreshments. The trolley boasts an eight speaker sound system for CDs and MP3s so you can fill the air with your favorite music or pre-recorded message. Also at your disposal is a microphone for delivering speeches, messages or announcements to the riders. "Are you looking to rent a unique vehicle for your private party? 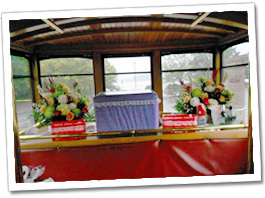 If you’d like a unique form of transportation for any private affair or for any group, The Peekskill Trolley will set your event apart from all others." 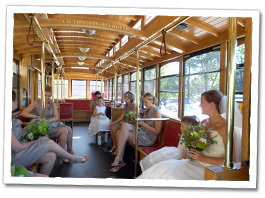 For events such as weddings, bar/bas mitzvahs, bachelor/bachelorette parties and birthdays, The Peekskill Trolley will provide transportation for your private affair that will keep you guests talking about it for a long time. The Peekskill Trolley Company offers a variety of tours, all of which are available at special group rates for organizations such as senior centers, schools, civic associations and social clubs. The area we serve is generally within a 50 mile radius of Peekskill, although exceptions can be made depending on logistics. Feel free to contact us to discuss your specific needs and how we might be able to help.